If we consider the curved surface of the earth as the horizontal plane, we get the four main directions. 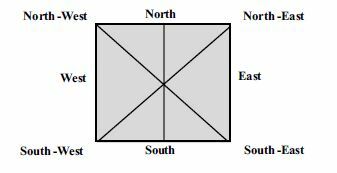 The East, The West, The North, and The South and the sub directions The South – East, The South West, The North -west and The North -East. Every direction has its own importance in Vastushastra. Based on these eight directions is the Ashtaksutra (eight principles Vastushastra. The East side belongs to the Lord Indra. The sun rises from the East & this direction is given the first position. The principal God of the East direction is Lord Indra. It gives prosperity and wealth. In all there are none Gods (Powers in this direction). 1. Ish (Shiva) 2. Parjanya (Paromeya) 3. Jayant 4. Indra 5. The Sun 6. Satya (Truth 7. Bhrush 8. Akash (The Sky) 9. Agni (The Fire). The West direction belongs to the Lord Varuna who has control and power over the rain and water. The principal Gods of the West direction are 1. Rog (Disease) 2. Pap (Sin) 3. Shesh (Cobra) 4. Asur (Demon) 5. Varun 6. Pushpadevta or Kusumdanta (flower) 7. Sugriv 8. Dwarpal (Doorkeeper) 9. Pitar (Fore Fathers) Out of these Gods Rog, Pap, Asur, Dwarpal and Pitar are having cruel powers. The principal God of this side is Kuber who has incalculable stores of wealth and prosperity. The Gods on this side are 1. Diti 2. Aditi 3. Sarpa (Serpent) 4. Som or Chandra (Moon) 5. Bhalat 6. Mukhya (Main/ Principal) 7. Nag (Cobra) All these are auspicious Gods giving happiness and prosperity. Lord Yama is the principal god of this direction. There are seven Gods in this direction 1. Usha 2. Vitatha 3. Yama 4. Krutanta 5. Gandharva 6. Bhrungraj 7. Mriga. The South direction is banned for all auspicious functions. This direction lies between the south and the east directions. Agni (fire) is the principal God of this side. This direction is used for Hom -Havan ( oblations by fire to a deity in a pit) and burying Vastupurush . The kitchen should always be in this direction. septic tanks, water storage tank, toilets or bathrooms should not be constructed in this direction. This is because cruel forces are contaminated or get dissolved in the pits or water and it can prove harmful to man. This direction is in the corner of the North and the West directions. This is the direction of Vayu Devta (The God of wind). Air is necessary for all living beings, therefore, tall structure should not be built in this direction. Tall trees should not be planted in this direction.